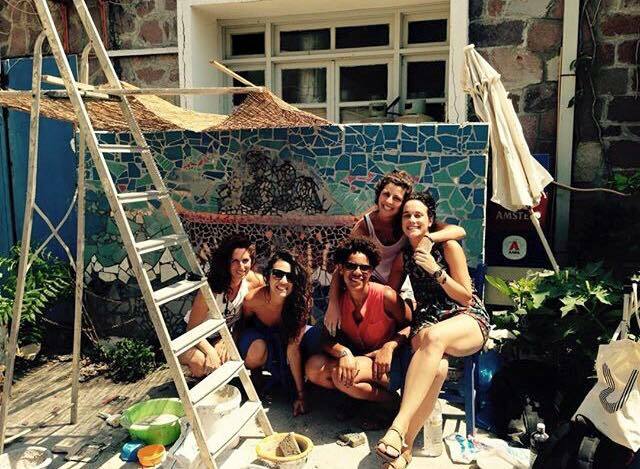 Lon-art team said goodbye to Lesbos and to Symbiosis Festival last week. We left with happy hearts, because we brought art and creativity to the most thankful participants an art educator could ever have. However, we also realised that our work and time was not enough to palliate these children’s thirst for learning and creating. That’s why we will keep supporting our partners at Symbiosis for the projects to come over the next years. They are doing an extraordinary job by bringing arts and colour to hundreds of families in need. -Symbiosis team, for offering us being part of this beautiful project. Symbiosis is the best example to prove that you can bring people together through the arts and also that art is a unique way to express feelings and opinions. -The donors that made this festival happened. With their funds we bought art materials and the mosaic and we paid for the transport to the Refugee Camps. And many thanks to other people who contributed with their ideas or support towards one of the most beautiful projects we ever led. Regarding the resources, we are pleased to inform you that we left the materials at Kara Tepe Refugee Camp, for the different school and art activities. We also have stored the rest of the tiles in a safe space, to continue with the mosaics. We are planning to come back soon, so please stay tuned.